If you’re like me, you probably spent afternoons as a kid watching Bob Ross’ The Joy of Painting on PBS with his magical paintbrush and his soothing voice. Bob Ross was always known as an eternal optimist. 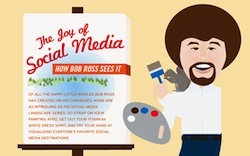 But, what would Bob Ross think of social media? The good people at Flowtown created this awesome infographic to depict the different social media sites (as seen by Bob Ross). 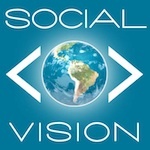 I love his image of Facebook as the “Happy Mega Mountain” with a shadow that looms over all of the other social networks. But, I think the Twitter image is my favorite. Bob says in the caption, “Few things make me happier than seeing a happy little blue bird tweeting with all his happy little friends…” It’s so Bob Ross-esque, it brings me back to my childhood. Which illustration is your favorite? Erin is the owner of Social Vision Marketing, a self-proclaimed social media geek, Michigan State University business alum, and a lover of all things northern Michigan.